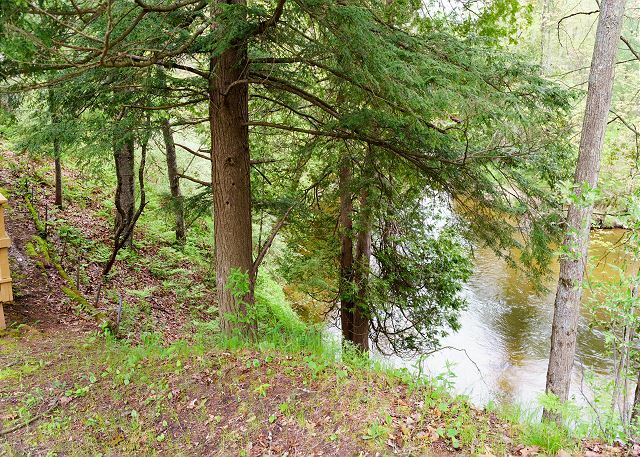 Amazing hill top views of the Pere Marquette River. 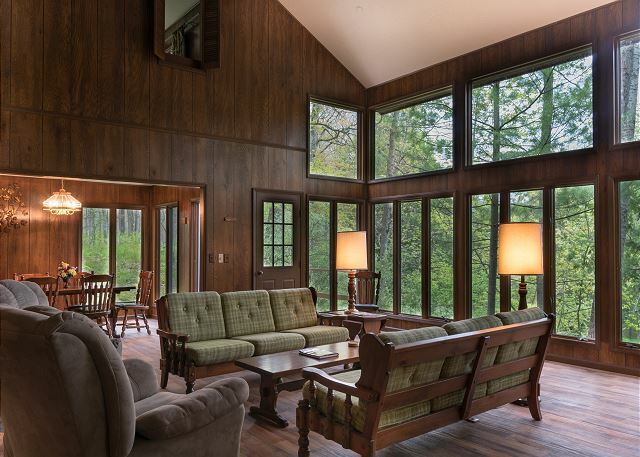 Huge open living room space with soaring ceilings and lots of windows looking out to the Pere Marquette River. 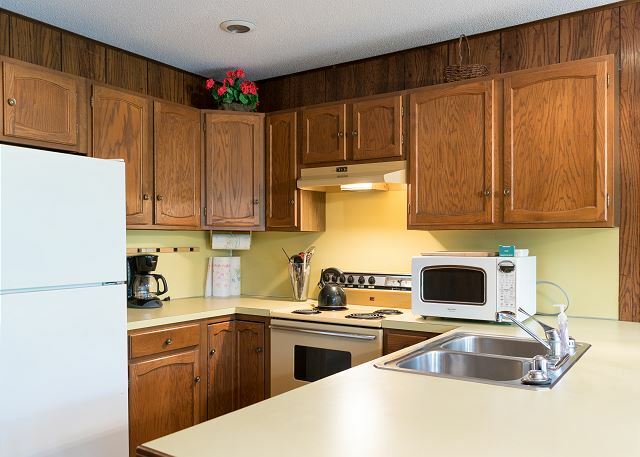 Fully stocked and equipped kitchen. Dining room and kitchen areas. 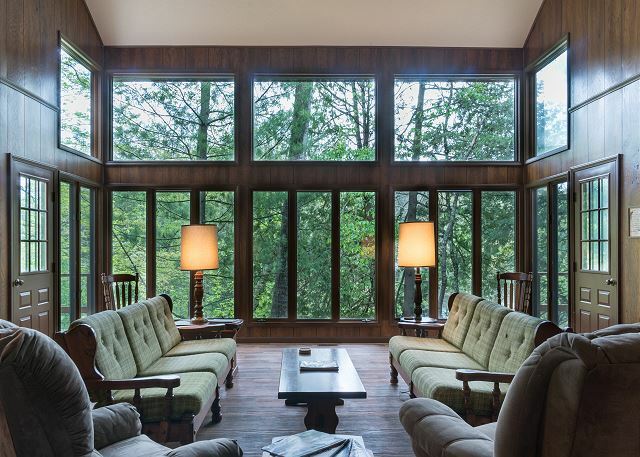 Living room area with soaring ceilings and lots of windows looking out to the Pere Marquette River. Washer and dryer inside the cabin. Bedroom with two double beds. Living room view from loft area looking down. One of the two private decks overlooking the river. Deck #2 overlooking the Pere Marquette River. Ridge top views of the river from the private deck. Amazing views, great fishing, and the ultimate place to relax. Living room with amazing views of the river below. 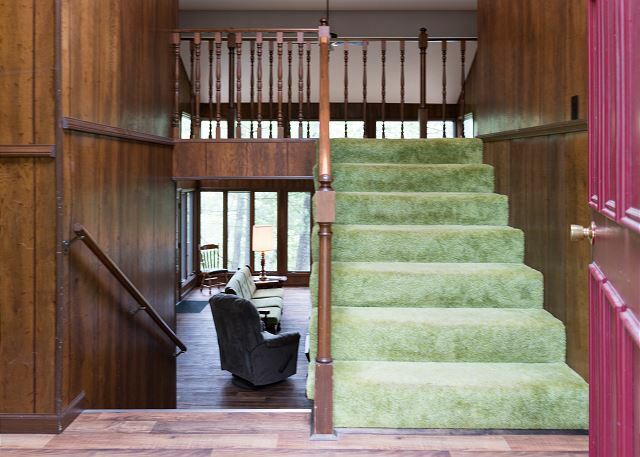 Stairs up to the bedrooms, or down to the living room, dining room, and family room areas. 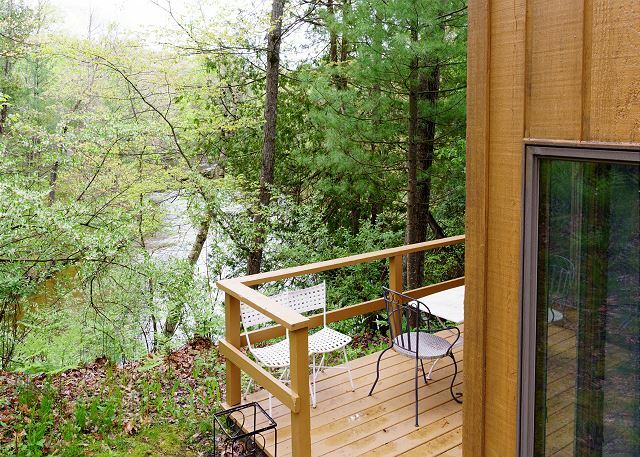 Cabin 4 sits on a ridge overlooking the Pere Marquette River. The views from the decks are simply amazing, they are the perfect spot to enjoy your coffee in the morning, or a cold drink at night while listening to the river water pass by below. 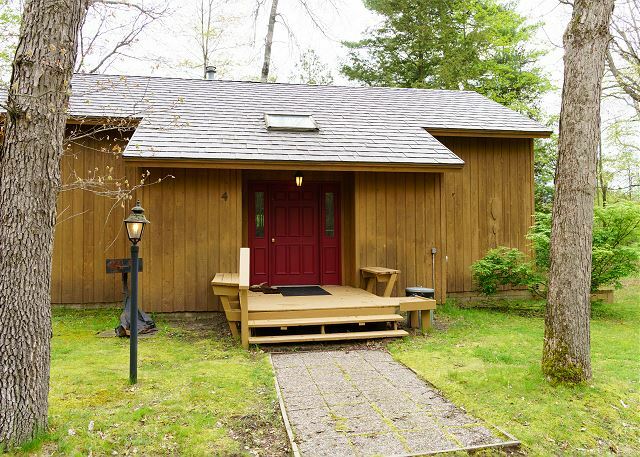 The cabin has 2 private bedrooms upstairs and sleeps 8 people total. 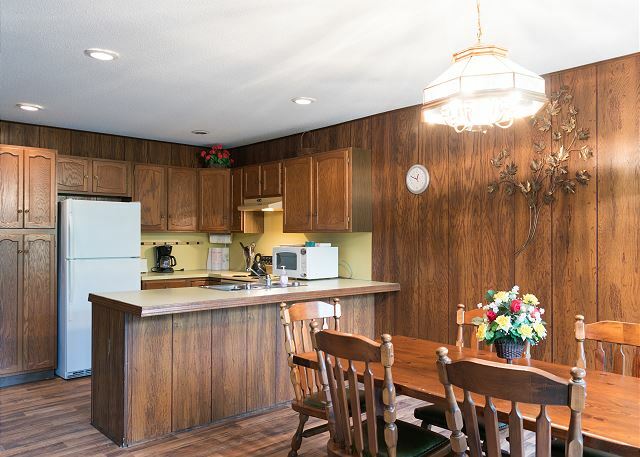 The main floor is huge, open, and bright and has a fully stocked kitchen, living room and dining room area . There are also two decks on either side of the living area. 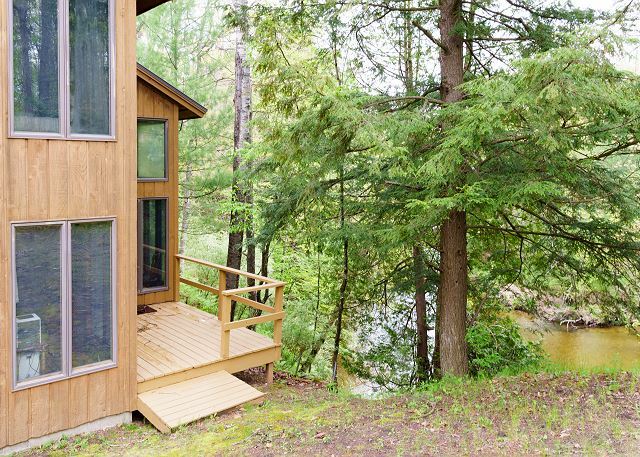 The cabin sits above a bend in the river, giving incredible views in both directions up and down stream. The fishing is spectacular in this location. This was a great vacation for everyone. There were five fishermen in our group. The hosts Cami and Chico greeted us as we arrived and made us feel welcome! They showed us the property as well as good fishing spots. 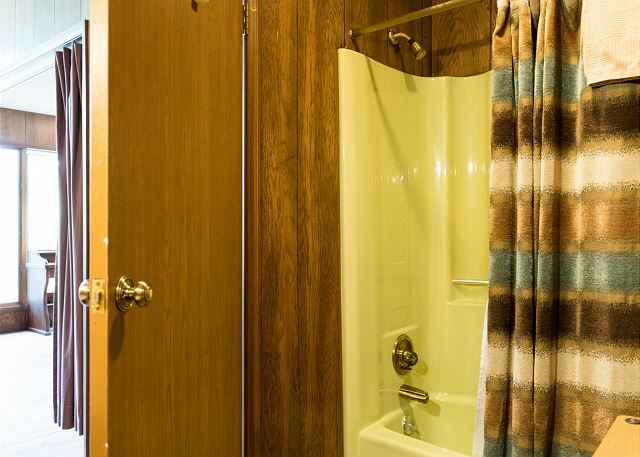 The cabin was super clean, big , and comfortable. We brought all supplies so we did not have to leave. They have a charcoal grill so bring lots of charcoal. The fishing was awesome!We will definitely book again next year! Perfect quite setting, awesome river to raft down. Chico and his wife the caretakers were awesome. Bugs are bad but thats michigan. Hi Travis - so glad to hear you enjoyed your visit to the Cannon River Ranch. It's a special place, and Chico and Cami make it even more special! Thank you for staying with Unsalted Vacations, please keep us in mind in the future. Good, but below the level of first time. 37 years ago. Hi Thomas - Thank you for taking the time to review your experience. Glad you enjoyed yourself, hope to have you back again soon. This was our 8th year in this cabin during the salmon run. The accommodations are good but starting to show their age. It would be nice to have wader hangers under the eves and the trail to the river could be improved. Thank you for the review, glad to hear you were able to come back and do some fishing. Absolutely beautiful, peaceful place-highly recommend! This was a hidden gem-I am so glad I found it. The cabin is far from any road and from other cabins. Complete solitude. Beautiful river-you can hear inside, along with wind through the trees. Very spacious, too! The caretakers, Cami and Chico were so friendly and welcoming. The only very slight drawback was the river was not easy access from the cabin-you can go down a slightly steep hill (my kids did)...but it didn't affect our planned activities at all. LOVE it here! We are so happy to hear you had a great vacation at Cannon River Ranch! Your 5-star review is greatly appreciated and we hope to have you back again soon! We had pregnant ladies in our group and asked the power whether we can check out an hour later (the check out time was 10 am which is a little early for a group of 8). Unfortunately, the owners did not agree. Other than that, the overall condition was good. This place is suitable for a people who like to spend the whole time in deep woods, and like to go fishing. There is a company in the nearby city (Baldwin, MI) that provides kayaking, it was nice. 1.5 hours drive to Traverse city (which we liked a lot). Do not forget to bring mosquito repeller! Thank you for your review! I apologize that we weren't able to grant you a late check-out. 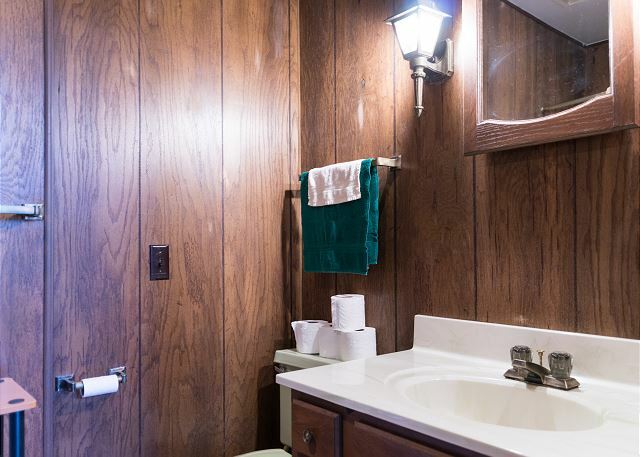 Unfortunately if the cabins are booked solid, it is vital to the housekeeping schedule that everyone checks out on time, so we may get the next renters in for their scheduled check-in. Thank you for understanding. We are glad to hear that you had a great time and hope that you'll visit us again soon! WOW!!! What an amazing property!!! 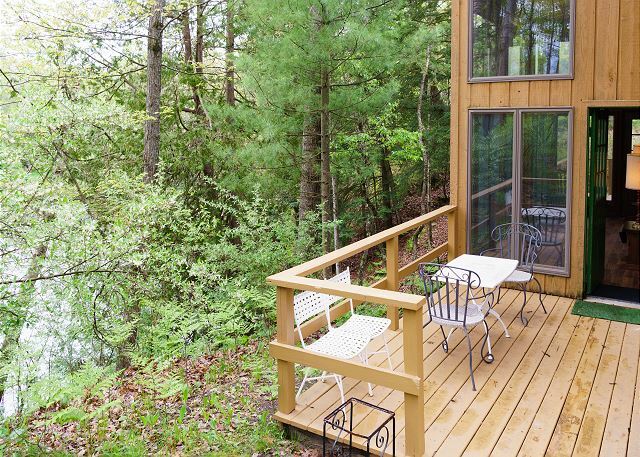 This is a beautiful property tucked away on the Pere Marquette river! 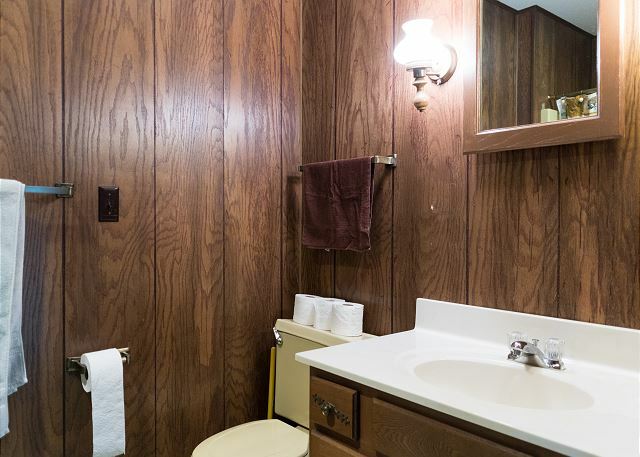 The pictures on VRBO are exactly what you can expect upon arrival! Cabin was right on the this beautiful river! The fishing was outstanding! The cabin was clean and comfortable! The people make the difference-- Caretakers Camy and Chico are simply the nicest hosts you could ever wish for! Outstanding people that really take pride in providing a great experience! Its not a matter of IF we are going back..... its a matter of how soon! Wow, we are so happy to hear you had an amazing vacation at Cannon River Ranch! We will be sure to pass your gratitude along to the property caretakers, as I know they take great pride in providing guests with a top-notch stay. Can't wait to see you for your next vacation!